September is finally here but it's still hot as hell in Texas. Growing up in Connecticut, September always signaled the beginning of Fall season, the trees ready to turn from green to a kaleidoscope of color. But not here, not yet, not even close. I'll be making my own Fall colors for a while, right in my salad bowl. I'll be living on cooling salads for a couple more months yet, and that's fine with me. I never tire of salads. They are full of living, vibrant nutrition, and if you explore the produce section and try new things you'll never get bored with salads. Think about combining a variety of colors to get the most bang for your nutritional buck. I like a little crunch in my salads so I'll often add some nuts or seeds, especially if my greens are on the more tender side. Currently I'm obsessed with hemp and chia seeds, I toss them into just about everything I eat. Any why not? They're loaded with protein and healthy inflammation-fighting omega 3 fats. Then there's creamy, don't forget to add something creamy, like avocado. Your salad can go from meh to magnificent when you add those two textures- crunchy and creamy. Here's a recent salad that I whipped up for dinner. It's loaded with anti-inflammatory nutrients, so if you're fighting RA like me (or any auto-immune issue), this is a good one for you to try. The beets add a wonderful sweetness, not to mention a vibrant burst of color, and they are super detoxifying to boot. Kale salads are great if you find yourself short on time. Kale, unlike most other salad greens, will hold up in the fridge even after you've dressed it. So make extra and keep it for tomorrow or the next day. 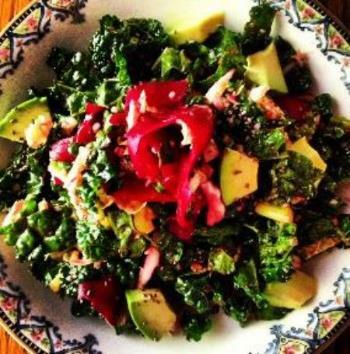 I make gobs of kale salad and keep it for up to 3 days. I like to portion it into big mason jars with lids. I just dump a jar full into my bowl and I'm ready to go. Ten minutes in the kitchen and you'll have salad for days. Toss all the ingredients together and taste, adding sea salt and pepper. If you want a bit more dressing just drizzle extra olive oil, apple cider vinegar and lemon juice over the top and toss again. Store in fridge up to 3 days. Posted on August 7, 2013 by Catherine Ruehle.